Part of the spirit of this time of the holidays is to take a moment and give back to others. So many of your — our readers — are a part of what has made Pinnacle’s 2017 so successful. 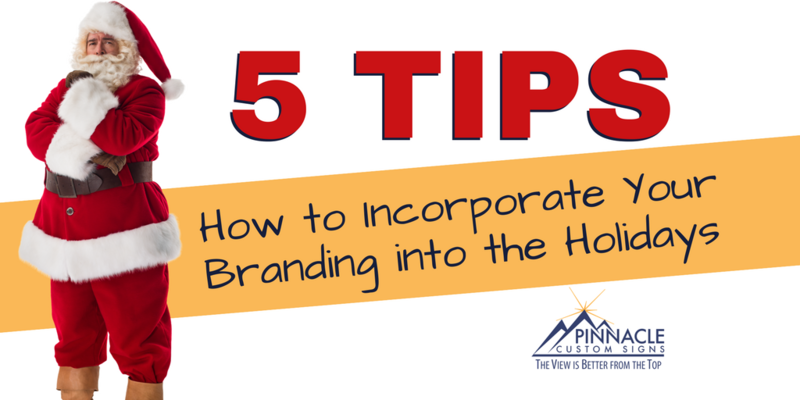 So, we wanted to take a moment and give back to you by providing you with a few tips on how to incorporate the holidays into your own branding efforts. It’s never too late to start! Adding a bit of holiday bling to your logo to enhance the festivities of the season can go a long way. 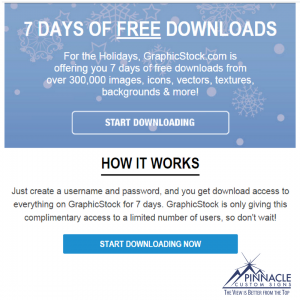 It helps show your company’s personality and lets your clients know that your company is in the holiday spirit. You don’t have to divert from your holiday colors to enhance your corporate look. Try wrapping the logo in lights, adding a seasonal setting, or enhancing with a sparkle or snowflakes. 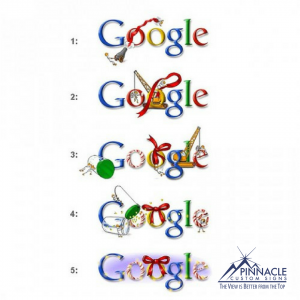 Major companies from Google to Starbucks take advantage of the holidays by adding seasonal flare to their well known looks – you can too! There are plenty of ways to add a little seasonal fun without losing your corporate look. It is not too late to add holiday promotions or specials to your marketing plan. 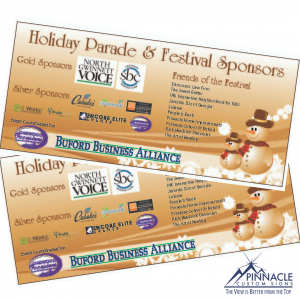 Small businesses that provide items perfect for the holidays can enhance their local marketing with banners. Banners are a cost-effective investment for short term promotions. Banners can also be effective for holiday messages or to promote holiday events. From 5K’s to Festivals, banners are some of the most effective forms of marketing to the local market. There large format provides great visibility to the increased holiday traffic on streets and walkways. Sound pretty basic, right? From bundling your products for gift baskets to creating special messaging for your business to business product line, put a holiday spin on your marketing. Direct to consumer products are usually the focus this time of year but they aren’t the only one who can gain traction during the holiday season. Business to business products can be successful during the holiday with the right marketing message. Creating online and in person signage and branding mixed with the right targeted promotions can add dollars to your end of the year revenue that match a business end of year needs to close out the year by adding new products and services to their own asset sheet. As you formulate your Christmas Gift list, don’t forget to add your company branding. Many companies take advantage of prepackaged products and mailing list to make sure their favorite partners know they are thinking of them over the holiday season. While some offer the opportunity to add logos, other products don’t add the personalized service. Consider the value of being able to add your branding to the gifts you choose this year. Branding for gifts can be anything from corporate wrapping paper, bows with your logo, or customized gift tags with personalized messages. Take it up a notch and hand deliver the gift. The month of December is the perfect time of year to partner with a non-profit. Choosing a charity that you are passionate about and co-branding your efforts is a smart way to close out the year. It gives your company the opportunity to gain new brand recognition with those who are strategically aligned with the cause and provides an outlet for the cause to help generate new funds for the coming year. So, find an avenue to help contribute the betterment of others through donate a percentage of your earnings or creating some type of fundraising awareness campaign to help spread holiday cheer to those who depend on the support of the community. Co-branding your business with a non-profit is not only smart for branding — it’s smart for team building. Getting your employees involved in service to the community can be a great way to bring the staff together and help make a positive difference. 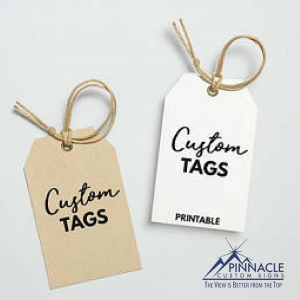 Pinnacle’s team can help you spice up your logo for a company banner or add your branding to promotional messaging for your clients and colleagues. 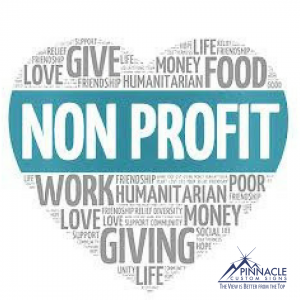 We also have had the pleasure of working with some of the best non-profits in the area and can refer you to great causes that would appreciate your support. Just give us a call and have a December to remember!